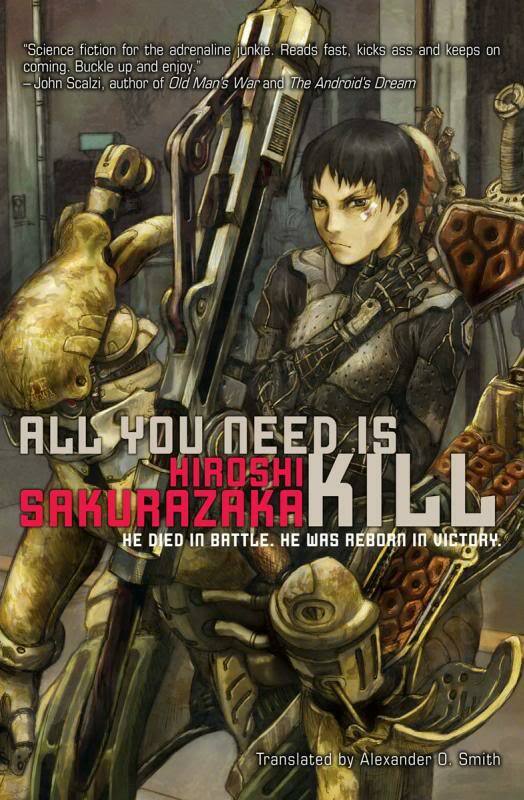 This review is for All You Need is Kill, the standalone novel by Hiroshi Sakurazaka (with art by Yoshitoshi ABe). The English edition was released in July 2009 by Viz Media, as part of their Haikasoru line. Sakurazaka has recently announced he is working on a sequel novel. I’m not a veteran of war stories, but my interest in this novel was piqued when a Hollywood film adaptation was announced (titled Edge of Tomorrow in most territories). I have not yet seen the film (it has only just barely come out in Japan), but I will probably give it a watch at some point so I can write up a compare/contrast post. For now I will focus solely on the novel itself. It’s the story of a young man named Keiji Kiriya, a new recruit for the power armor-wielding defense force fighting the droves of “dead frog” aliens called Mimics. The day of a huge battle arrives… and Keiji is quickly killed. It’s a jolting start that kicks off the core plot element of this story: the protagonist is caught in a time loop. Day after day, he is drawn to the battlefront, only to be painfully killed again and again. His only hope is to become a soldier strong enough to survive the battle, and so he enlists the help of his commander and an American soldier named Rita Vrataski. It’s a rough and gritty story, and the author did well to get across just how miserable an experience it is out in the battlefield. The process in which Keiji comes to grips with the heinous circumstances he has gotten himself caught up in is described with grim straightforwardness, but the author does well to blend in some humor (dark and otherwise) to shake things up a bit. Keiji makes for a strong narrator, and the story is paced in such a way that the central plot element of repeating the same day forever never actually feels repetitive. Keiji is always trying something new, and the author is willing to skip ahead many time cycles at a time to keep things moving at a brisk pace. All You Need is Kill is a quick read, and a page-turner that is effective primarily thanks to its engaging premise. It is a story that is held up almost entirely by its sci-fi concept though, so if the premise does not interest you there may not be much else for the novel to offer. That said, I found it satisfying from start to finish, and I look forward to the potential sequel. What’s interesting about All You Need Is Kill is that while it’s a very “action-y” novel, evidenced by the fact that it has quite a dozens of adaptions – manga, movie, graphic novels, etc.. (#whereanime!? ), it also prides itself being a SF literature piece; and what we get is an interesting blend of hot-boiled actions and food-for-thoughts. Still at the end of the day, the main premise behind the novel is that of a sci-fi concept, so I do agree that the novel is being held up mostly with it’s own sci-fi premise. I still like it though. An anime would be good, but perhaps the adaptation it needs most is a video game? I found it interesting, reading in the author’s notes at the end of the book, just how much the general tone of his story was influenced by his experience with games. It makes sense though–you die a hundred times before you actually win the game, and your ability to complete the final stages is a direct effect of having honed your skills and reflexes over many hours of play. Eventually you know exactly how the enemies will attack, and you take them down without even thinking–parallels to the experience Keiji went through. Stories can hook readers in many different ways. Some are driven primarily by deep characterization, some by a complex plot full of clever surprises, and others by rich world-building or pensive themes. In the case of All You Need is Kill, I would call it an “idea story.” It asks a “what if?” question and rolls with it–something that has been the foundation for many works of sci-fi over the decades. It worked well in this case, as I didn’t have much issue with the prose, characters, or pacing of the novel. I remember saying the same thing to Muv-luv, lol. But yeah, a video game adaption sounds good. It’s interesting how he likened that “grinding” concept in video games you mentioned, and turned it into a time looping story. Thinking back, the way how Keiji kept powering himself up (aka level up in game terms, lol) through the time loops is pretty much adapted from this idea. I read this about a year before the film was announced. I haven’t seen the film, but based on reviews of friends, it seems the movie takes liberties with the book that aren’t quite as good yet not necessarily bad. Like you, Cho, my interest in movies waxes and wanes heavily and I rarely pursue watching very many. I’ll get around to this one when it hits Redbox though. I thought the book was really good, if not stellar and up to the hype that the novel seemed to have for it going in (“one of the most original/greatest sci-fi war stories ever!” is sort of the vibe it had online or from a lot of people). I did appreciate the originality it did have, as usual with LN books. I recognize that this one has a bunch of unique things about it that stand out, everything from fresh sci-fi ideas to philosophical overtones on the nature of war. Still, I’d call it a solid one-time read – there were some small plot points & pacing issues that just held it back for me. As you seem to suggest, this is not necessarily the book people would want for pure entertainment or as a genre story that doesn’t beg for a fair dose of nitpicking/streamlining. This is more of an “idea” book that asks you to think conceptually as you might in a classroom versus as much just sitting back and enjoying fun robo-alien action. Lol, I’m not beyond “thinking” but that very factor is part of what held it back for me. I don’t need “action” necessarily, but I come to these books mainly for escapist adventure/comedy and less so for a philosophical sermon or symbolism. It did keep me flipping pages, yet I think it coulda/shoulda been even better given what strong ingredients it already had going for it. Nevertheless, I’d read a sequel. Especially if it goes into a completely brand new direction or even a new genre (which is possible, given where the books concludes). I never saw Edge of Tomorrow either (theaters are really expensive in Japan!! ), though I probably ought to at some point. Would be good for a blog post at least. =P But yes, from what I hear much of the film’s plot was changed (including the ending), and everything Japanese in All You Need is Kill was removed entirely. That’s just Hollywood for you though. Nice review! I liked that you did a comparison of the two takes on the story. It sounds like the manga had a change of focus thematically, painting the story in a different tone from the original LN source. I’ve always found the process of adaptation an interesting topic. Thank you! I also find adaptation interesting, though I’m not yet very knowledgeable at it.